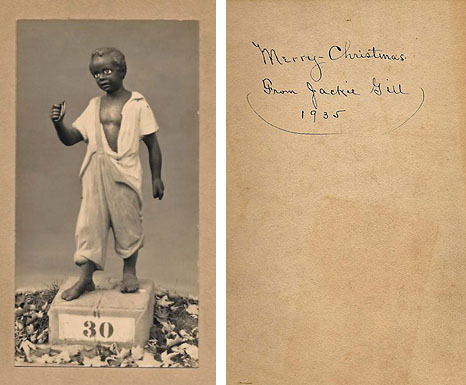 1935 Christmas card featuring a Lawn Jockey. 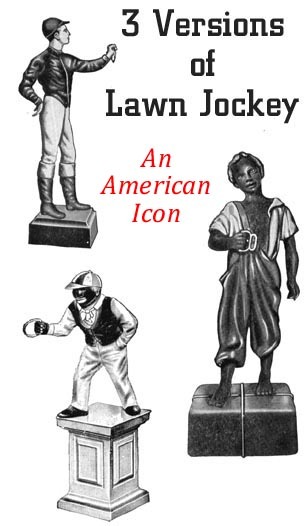 We get many questions regarding the origins and rich history of the great American Lawn Jockey statue. Many are surprised to learn that the Lawn Jockey is actually an evolution of 3 related statues and was used primarily as a horse hitching post in the 1800’s. The Lawn Jockey makes history come alive with legends of tours of duty in the revolutionary war and civil war. Like a time machine, the cultural significance of this unique sculpture has touched many areas of society in important ways and is still evolving hundreds of years after the statue first appeared. Above is a page from JW Fiske’s 1910 catalog. Note that there were other jockey versions other than the 3 main versions. Fiske’s “Chinaman” version can be seen in the Charleston, SC photo above(the jockey on the left). 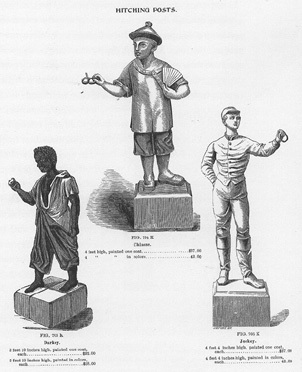 There were hundreds of iron foundrys making jockeys in the 19th century but the 3 biggest manufacturers that had catalogs and marked their products were JW Fiske and JL Mott of New York City, and Robert Wood and Company of Philadelphia. The “big 3” manufacturers all made the 2 jockey versions as shown below in the 1902 JL Mott catalog. The “caricature” jockey version was not cataloged or manufactured by the “big 3”. Jockeys were mainly used for residential applications in the 1800’s, but also were used for trades as well. Although they eventually were most closely associated with motels and restaurants as a symbol of “welcome” in the 1900’s, their main location/purpose in the 1800’s were to identify tobacco shop storefronts. 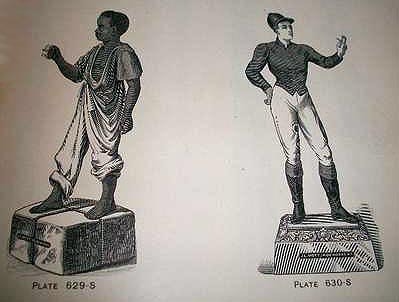 Historical documents from manufacturers show zinc statues were made for the trade/tobacco shop applications, while iron statues were made for residences. “Welcome home”, “horseracing”, and “history” are the 3 primary themes of all lawn jockey statues, reflecting charming memories of a bygone era. Many other themes are represented in this uniquely American statue, some of which are described here and on other pages on this website: patriotism, George Washington, the American revolution, slave participation in the revolutionary war, Greek influences in American art and architecture, the Statue of Liberty, Christmas, the Underground Railroad, Black Americana, ironwork and the industrial revolution, 19th century American iron toys, forgotten black jockeys of the 1800’s, the Kentucky Derby, southern hospitality, the American centennial, and the American Red Cross. Now let’s fast forward to 1776, on the eve of the American revolution, where the Lawn Jockey legend began. 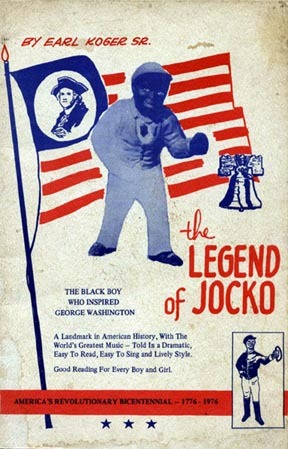 Beginning as oral tradition, in the 1960’s and 70’s the source material for this legend was eventually published in book and theater play form by Washington DC insurance agent Earl Koger(see play cover below) and in news articles by Washington Post reporter Chester Hampton. CLICK HERE to read Chester Hampton’s newspaper article on September 27, 1970. Recorded history documents two colonial army deaths in the Battle of Trenton, which was a significant victory for the colonials. Both soldiers froze to death on the river crossing, not killed in combat. But legend tells of one more casualty… Jocko, who was found frozen to death on the Pennsylvania shore while still holding the lantern when Washington returned at noon on December 26, 1776. Legend has it that upon Washington’s return to his Mount Vernon, Virginia home, he was so inspired by Jocko’s heroism, he commissioned a cast iron statue of Jocko holding a lantern and called it the “Faithful Groomsman”. The “welcome/coming home” theme of these statues started here, and with an ironic double meaning: “coming home” being also used as a metaphor for “dying and going to heaven” from Christian theology. The last name “Graves” associated with the statue also offers a cryptic allusion to a cemetery grave – was the original statue a grave marker for Jocko? Taking into account that very few slaves had last names in colonial America, the grave marker explanation seems plausible.